My pregnant friend Jill has been craving cake lately, so in addition to making a diaper cake gift for her baby shower last weekend, I thought I’d give the mama-to-be some real cake to sink her teeth into! 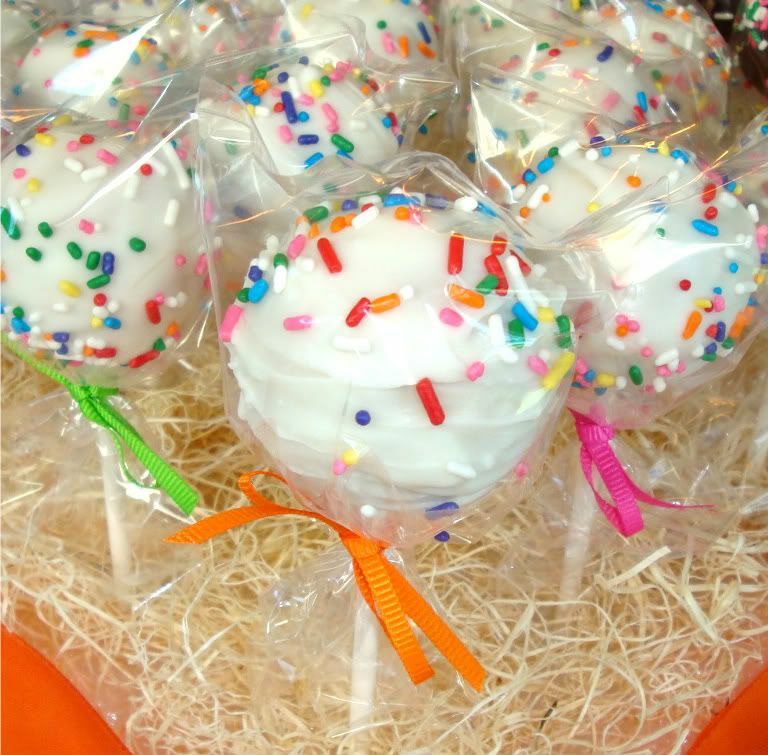 I first saw these cake pops on my friend Carla’s blog and thought they were such a neat idea! 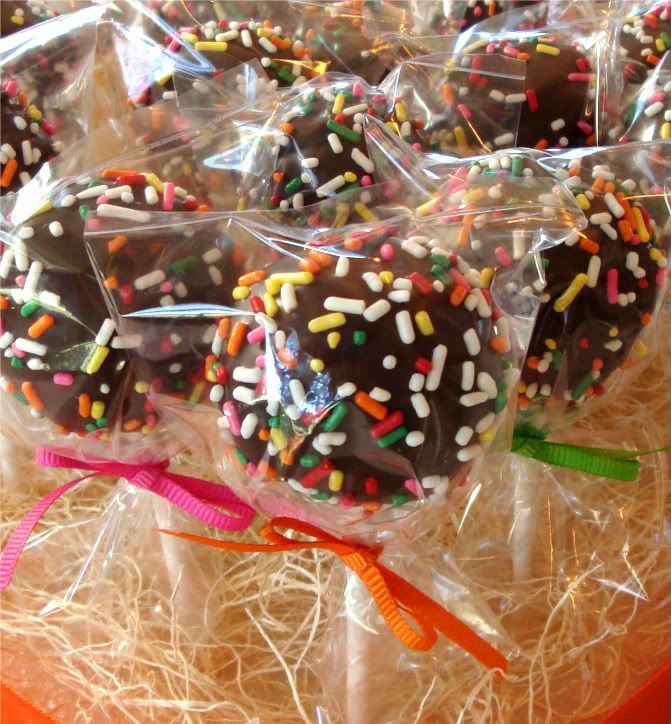 They’re lollipops, but instead of a sucker candy topping, they’re topped with chocolate-covered cake. Pretty neat, huh? I tracked down the recipe, along with many helpful tips, at the source–Bakerella. This woman does amazing things with cake. Spend five minutes at her blog and you’ll gain tons of baking inspiration and at least five pounds just staring at her delicious photos! 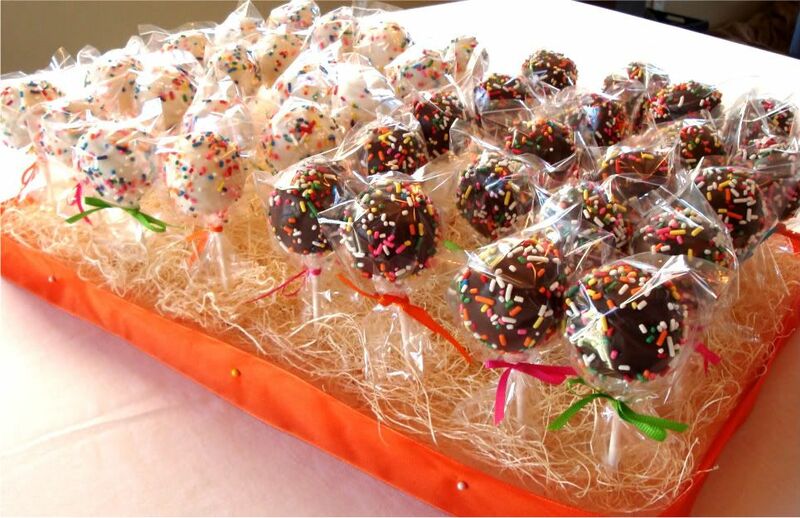 After you dip the cake pops in chocolate, they need to sit upright to dry. I poked them into a rectangular piece of styrofoam to dry and later decorated the styrofoam with decorative moss and ribbon, and used it as the “platter” at the shower. Although they were time consuming, they were a lot of fun to make, and even more fun to share. They were a huge hit at the baby shower! And since they were individually wrapped, guests were easily able to take extras home with them to enjoy later or to share with others. And for those of you looking for even more baby shower inspiration, I have to tell you about another neat idea of the day. Jill’s friend Saz–the wonderful host of the shower–did an ice cream sundae buffet with ice cream and toppings from Culvers. I just loved this idea–it was so good! YUM! I love the ribbon colors too, my favorite combo! I love you for posting that link! I’ve been looking for it lately!! Your pops look amazing! Where did you find the sticks & plastic wraps for the top? They look great – perfect for a baby shower. How cute! I hope a friend of mine reads your blog b/c I really want a diaper cake..that looks amazing! And that is exactly why the food is my favorite part of any organized event. I love Bakerella and I had grand intentions of doing the Cake Pops for my cousin’s baby shower. We ended up make delicious lemon cupcakes but I think the pops would’ve been yummy… and your display looks down right adorable! Impressive! You sure have a lot of talents! PS- just linked to this in my blog! I made of these for Mother’s Day and I swear that melting chocolate is the devil! There was even some on the dog before it was over! Yours look fabulous though!!! I have never seen anything so cute in my life. Love it! What kind of chocolate did you use to dip them in? Where did you purchase the wraps? Are they just lollipop wraps that can be purchased at a craft store? I’ve always wanted to try these. Yours look beautiful and I bet they were delicious! Mmmm… those look fantastic! Excellent job. Love Bakerella. Wish I also had her talent! @C–I found the lollipop sticks and the plastic covers at a local cake supplies shop (Vanilla Bean for all my locals), but I also saw them at Michael’s when I was there buying ribbon. @Fun & Fancy Free–see above for my answer about the sticks and bags. I just purchased bags that I thought would be a good fit. They weren’t specifically for lollipops. I used “Candiquik” brand coating which I purchased at SuperTarget, and it turned out great. Hope that helps! They look great, Dusty! Gosh my mouth is watering SO BAD right now! Did I mention I highlighted you without your permission on my blog? I’m in love with you. Not that kind of in love but… oh who am I kidding! The pops are the cutest things I have ever seen!! Wow!! I can’t even imagine how long it took to make those. How do you have the time to do everything PERFECT? LOL Your house, your wardrobe…sweet things for your friends and you still have time to work out!! What’s your secret? @Carla–thanks for the inspiration! I never would have seen this great idea if you hadn’t done these for Connor’s birthday! @Magpie–just checked it out and can I just say–WOW! You flatter me–thank you so much!! Very tasty looking indeed! I love millions (the lil bits of colored sweety). For some reason I like freezing chocolate lollipops, I think it makes them taste better. Love the cake pops! I made some for easter and they were no where near as round…hmmm. @D. Ramblings–I look forward to hearing how it goes. Good luck! Hi D!! I just wanted to tell you I saved my cake pops and brought them to the lakehouse after the shower. My nephews stayed over after the reunion and my nephew will who is 5 was so excited for his cake pop. he kept opening the fridge and looking at it and he even tried telling my dad he could eat his treat for breakfast (even though I told him he could have it AFTER he ate his lunch.) So now my mom thinks it would be a fun project to do with Will and I quickly said NO! too many steps!! They were awesome, it was great to see you! @Taps–Awww, that is too cute! Glad to hear your nephews liked them! It was so good to see you at the shower! Hope you’re doing well, and hope to see you again soon! I too found lollipops at Bakerella! I made Brownie Lollipops and they were VERY well received! @Amanda–those look delicious. Great job!